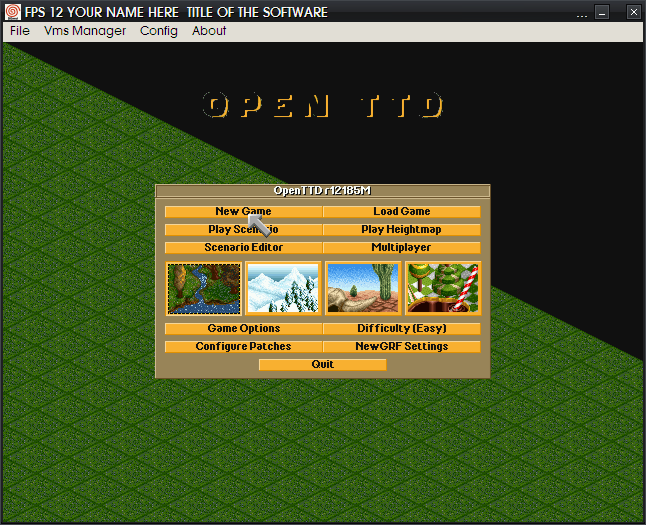 Open Transport Tycoon Deluxe (or OTTD) is an open source clone of Chris Sawyer's Transport Tycoon Deluxe (1995). TTD is the sequel to 'Transport Tycoon' (TTO) which was also released by Chris back in 1994. OTTD's main goal has been to update and enhance the greater majority of original game features, including the ability to add new graphics and sound. After originally developing with the guys of TTDPatch, I decided to see what OTTD was like and how portable it was... since it was open source. My first attempt was to see if it would run on the Dreamcast. This console, released by Sega on November 27, 1998 and was way ahead of it's time. It unforunately failed to gain a strong market and instead brought on more of a cult following. Games like Shenmue were to define the Dreamcast experience; but never really made it big in the western world. One benefit of this failure is that nowadays you can pick up a console for relatively cheap. The Dreamcast also had accessories such as the keyboard and mouse which would aid gameplay for titles such as Quake and its sequels. You can still find great tutorials on Dreamcast programming all around the web. Run this with DEmul... It's a pain to get working, but in the end it'll run... you'll just need to source BIOS' and stuff yourself if you want to test it. Stay tuned, I'll attempt to re-image a CD that I have. Anyway... I'll update if I ever get back around to it. After downloading the Dev ISO (as linked above) again, I had a bit of help from Rubidium on tt-forums and got the mongrel re-compiling. To the point where the debug screen (stderr) of nullDC actually outputted my text! $ CFLAGS="-I$KOS_BASE/include -I$KOS_BASE/kernel/arch/dreamcast/include -I$KOS_BASE/../kos-ports/include/SDL-1.2.9 -I$KOS_BASE/../kos-ports/include/zlib-1.2.3" LDFLAGS="-lm -lconio -lSDL_mixer -lSDL_image -lSDL_129 $KOS_LIBS" ./configure --os=KOS --without-libicu --without-fontconfig --disable-network --without-allegro --without-threads --endian=LE --cc-host="kos-cc" --cxx-host="kos-c++"
Rubidium has been doing some more great work ... a lot more solid than my hacking around... we've added a lot of support to the OpenTTD codebase to interact with the KOS build tools to the point where the command-line arguments are minimal and compiling is a much happier task. $ LDFLAGS="$LDFLAGS romdisk.o" ./configure --os=KOS --cc-host="kos-cc" --cxx-host="kos-c++" --with-sdl --with-png --endian=LE --personal-dir="/rd" --install-dir="/rd"
Well, After a lot of rapid hacking the app compiles... finds resources... but it seems that no SDL example will display anything on my version of nullDC. Rubidium reportedly had the game running but it soon ran out of memory... something that would require an overhaul of every part of the game. Anyway, since it's more or less done... and that no one is interested in even playing it... I think, as I did last time, this will just be put to rest again. The challenge was set and the game ran 'enough' on an emulator. Done. Here's a link to a forum talking about this port. Hello, what about updated to latest version port ? Thanks for the offer, but I’ll pass… There’s enough information in this post and on the linked tt-forums.net thread if you’re keen.